Sponsors: FOX News, the University of New Hampshire and the New Hampshire Republican State Committee. Candidates: Tom Tancredo, Ron Paul, Mike Huckabee, Rudy Giuliani, Mitt Romney, John McCain, Sam Brownback and Duncan Hunter [all 8 of the major announced candidates]. Moderator: FOX News' Washington, D.C. managing editor Brit Hume. Questions also from "FOX News Sunday" host Chris Wallace, citizens in Young's Restaurant via FOX chief political correspondent Carl Cameron, and from FOX White House correspondent Wendell Goler. Audience: About 3,600 people. About 925 tickets to UNH, 75 to each campaign, and the NHRSC sold tickets to the debate and the pre-debate reception for $50 for preferred seating and $25 for general. Broadcast: Aired live on FOX News, FOX Radio and four NH radio stations; WGIR, WGIP, WGIN, and WTSL. Format: Answers limited to one minute each. Rebuttal time, if needed, 30 seconds. Background: This was the second Republican debate in New Hamsphire. Additional Notes: The debate was overshadowed by the not yet formally announced former Sen. Fred Thompson (R-TN), who ran 30-second TV ad during the broadcast and later showed up in a taped appearance on the "Tonight Show" with Jay Leno where he declared, "I'm running for President of the United States." (Thompson's formal announcement, done in a webcast, went up shortly after midnight on the morning of September 6 at www.fred08.com). 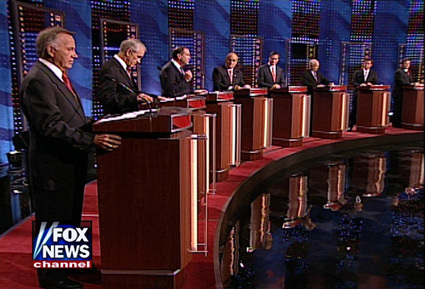 In fact, Hume's first question dealt with Thompson, allowing many of the candidates to deliver humorous prepared lines.